Modoc — Black Eyed Lover — Absorb. Nashville rock band MODOC released their new Brendan Benson-produced album AUTOMATIC + VOLUNTARY in February 2016, and we were glad to make the vid for the single "Black Eyed Lover", a song about dark, cyclical dysfunction. In the vid, actress Kat Scott portrays MAL, a mysterious, disturbed being who is the source of the songwriter's distress. 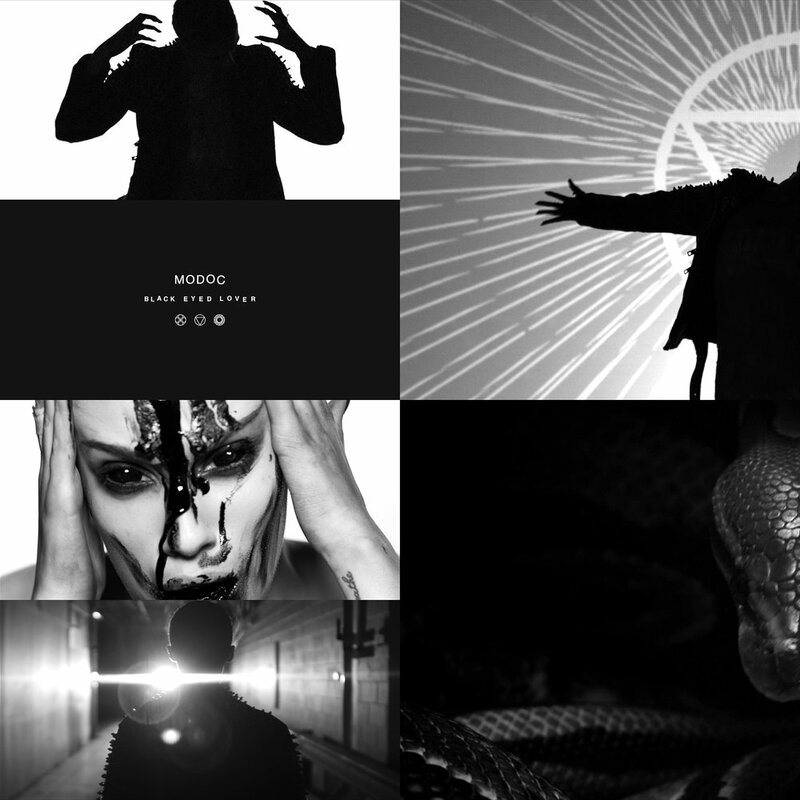 MAL delusionally believes herself to be a serpent, and carries a toxic madness everywhere she goes... until literally, physically overflowing with the darkness. Using custom-constructed projection content on ceiling-rigged screens, cryptic symbolism, live ball pythons, and in-camera facial special effects, we brought the dark, twisted mind of MAL to life. The video premiered online in March 2016. MODOC's new album AUTOMATIC + VOLUNTARY is available everywhere now. ASSIST / PRODUCER JARED SPARKMAN. FILMED BY MIKE YONTS & OWEN THOMAS. STYLE / ART DIRECTION BRITTANY TERHUNE. MOTION / SYMBOL DESIGN BY SAM KAUFMAN. EDIT & COLORIZATION AT ABSORB. FILMED JANUARY 19, 2016 IN INDIANAPOLIS, IN ON THE RED EPIC.